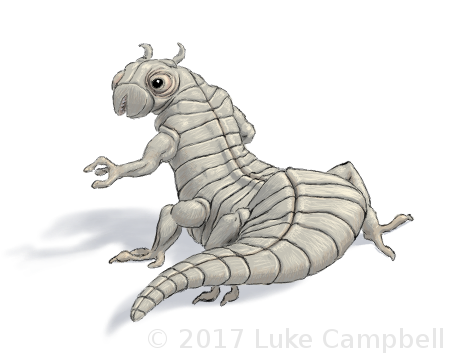 A Laer looks something like a wasp-headed centaur-salamander, with a body segmented like an annelid. Their skin is thick and smooth, and usually grey colored. A Laer's head has two turret-eyes, a snout with a horizontally opening mouth, and two small backward-pointing antennae. Each hand has three fingers, and each foot three toes. A Laer has four nostrils - two on the underside of its snout and two just in front of their antennae on the top of their head. The snout pair are used for smelling, and those on the top of the head for breathing when mostly submerged in the water. They do not breathe through their mouths. The Laer's lungs run along its back, from its shoulder to the base of its tail. Laers have two hearts, mirroring each other in their mid-chest region. Their digestive system occupies the lower half of their torso and abdomen. Their main nerve cord runs down the center of their body. The eyes of a Laer are turreted like a chameleon. Each eye can point independently, or they can both focus on the same object for binocular depth perception. Laers can see four primary colors - red, green, blue, and near ultraviolet (UV-A). Their eyes are daylight adapted, and good at discriminating detail. Laers have a good sense of smell, and can identify objects and individuals by smell alone. They use smell for social signalling and scent marking, and can easily track an object by its scent trail. The hearing of a Laer is mostly tuned to mid and lower registers. They are deaf to high pitched sounds, but can detect infrasound. Laers can also feel vibrations through the ground if their belly is pressed against it and they are not moving, allowing them to sense approaching beings by their footsteps. In water they can detect minuscule pressure changes, such as are generated by swimming animals or people, boats, or submarines. The voice of a Laer is a low rumbling growl. They can easily speak human languages and Sequential, although they have difficulty hearing people with high-pitched voices. Tweechis and Laers have difficulty talking to each other, since each speaks in acoustic ranges that the other cannot hear well. Laers do not need to open their mouth to speak. There is often no external visible indication that a Laer is talking. Among themselves, Laers communicate moods and physical state by smell, and leave scent smears as calling cards and to claim ownership of a place or object. Laers usually speak their traditional language called Wroeng. However, it is near universal for Laers in the Verge to speak English as well. Laers move with a lizard-like slither, often sliding their bellies across the ground. When moving, they often keep their torsos horizontal, particularly for getting through cluttered environments, but will move with their torso upright when in open areas and they want to look around. Laers are well adapted for moving over soft surfaces with bad footing, such as mud and sand, and they almost never become mired. A Laer can wriggle as fast as a Human can run for short distances, but cannot keep up that pace for as long as a Human. Laers are exceptional swimmers, using undulations of their body and powerful tail to propel themselves through the water. A Laer can hold its breath for over half an hour when not exerting itself. Laers can free dive to depths of a few hundred meters – farther with practice and acclimation. Laers are highly resistant to the bends. Laers are omnivores. They have a diet rich in starchy root nodules, which are usually mashed and boiled, and their planet's equivalent of fruit, nuts, and algae. They eat small animals whole and, often, alive. In the Verge, where their planet's biota has not been transplanted as frequently as that of Earth, they happily replace their usual fare with grains, tubers, fruit, nuts, and vegetables from Earth, as well as mice, rats, chickens, crickets, mealworms, roaches, fish, shrimp, and crabs. Fire does not burn on the Laer's homeworld. Consequently, their food is traditionally cooked using concentrated solar power rather than flame. Community ovens were traditionally made with faceted reflectors made from certain local shells of shiny marine creatures. In the modern Verge, some Laers still enjoy cooking in their native manner (although usually using modern materials for the mirrors), but most use electrical ovens and stoves. Laers are hermaphrodites. They lay eggs, which are incubated in a brood pouch on the Laer's underside. Young Laer are raised by their mother and her covey, and remain in their mother's covey at adulthood. Laers are exogamous – they only mate with Laers from outside their own covey. Laers are bold and daring, approaching the world with attitude, perseverance, and belligerence. A Laer will not easily back down from a threat or challenge, preferring to face the danger and beat it back. This bravery can cost them dearly, but their reputation for aggressively confronting their antagonists means that few are willing to cross them lightly. Similarly, Laers are renowned for their persistence and endurance, following through on the tasks that they start no matter the difficulty. The main unit of Laer society is a multi-generational family called a covey, led by the oldest and wisest matriarch with advice of the rest of the group. Coveys associate in loose tribes, although in modern Verge life tribes are less relevant and coveys integrate into Human and Pannova communities. Although Laers are still very much a minority in the Verge, their ambition and drive have led them to success. Many have become wealthy business-beings or powerful politicians, others are well known activists, actors, artists, innovators, or scientists. The Laer homeworld had a great variety of native cultures. However, most Laer in the Verge come from a group of closely related cultures, near where the Human wormhole first impacted. The traditional Laer architecture is dome-shaped or conical huts, made of reeds and mud (wattle and daub), sometimes on stilts when water levels in their swampy homes tend to fluctuate. Few use this style any more, and Human-style building methods have largely been adopted. As with the Pannovas, there are differences to account for their different body shapes – for example, the ceilings are usually lower, and they rest on cushions or mattresses rather than chairs. Since Laers prefer to live in wetlands, their houses often still use stilts and may feature moon pools for moving directly between the water and indoors. A traditional form of Laer artwork is mud sculptures. Despite the name, after casting the sculpture cures into a concrete-like hardness and durability. They are also usually brightly colored, either by painting or incorporating pigments into the mix or tiles on the surface. A Laer sculpture symbolizes the history or important events of the laer community, covey, or society that made it, or represents elements of Laer mythology and religion. Each Laer community center will have one or more, and most coveys will mount a sculpture in their yard. Since encountering Humans, some Laers have adopted new materials for sculpting, such as wood carving or metal welding. Laer clothes will be able to withstand getting soaked, are easily cleaned of mud, and generally have slick, reinforced bellies for slithering. Common Laer clothing is a one-piece body wrap fastened on one side. Laers do not appreciate music. The closest they come are the penetrating rumbling roars they use in covey or community get-togethers, but though this serves a somewhat similar function Laer roar-fests lack anything in the nature of rhythm, structure, or melody. Laers enjoy swimming, and many of their sports involve aquatic elements. Swimming races, breaching (seeing who can jump the highest out of the water), diving, and catch the crab (a team sport to see who can end up with a skittery aquatic prey animal native to the Laer homeworld, often involving all-out brawls between the teams to take the critter from the other side. Often, the animal ends up in pieces. The winning team gets to feast on the animal – if the animal is ripped apart, each team gets to eat what it takes). Laer judo is also common, where two Laers wrestle with each other with the intent to push or throw the other to the ground on his or her back and pin him or her there.